Are you looking for a good, short, hockey book to read to your kids? Then you definitely have to consider Howard Shapiro's Hockey Days. They say don't judge a book by the its cover. That would be good advice for Hockey Days. That sounds mean I know. But the cover illustrations greatly pale to quality graphics inside the book. This is a highly professional project and it deserves a better first impression. I asked several kids and they all concurred, with thoughts ranging from indifferent to turned off. Which is unfortunate because Shapiro's heartwarming story shares an important message for juvenile readers, and adult readers will enjoy reading the title with them. Like so many families, a young street hockey-crazed boy named Tom and his father are brought together by sport. Through his father's reminiscing Tom learns the values of teamwork, friendship and always giving it your all. Though the book is about hockey, he is really talking about the grander stage called life. And that is a great lesson all kids should be hammered with, over and over. Many adults, too, for that matter. Tom also gets to spend some real quality time with his dad, something which seems hard to do in today's busy life. And by doing so not only are Tom and his dad brought closer together. It also inspired Tom to carry on his dad's traditions, and therefore keeping him closer to his heart. It is a really well written short story, although I must admit everyone in my household kept stumbling on the term DEK hockey. Even I was not 100% certain that was the brand name of that orange street hockey ball, as mine lost the brand name markings a few years and 100s of street hockey games ago. 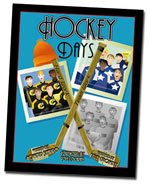 Hockey Days is the third independently published title for the Pittsburgh-based accountant Shapiro. He has another hockey book coming out in the second half of 2008 - Hockey Player For Life. Check out the author's website so you can download your very own hockey stick bookmark. Shapiro's writings are complimented with the illustrations of Kelly Brownlee and the foreword by recording artist Tom Cochrane.